Kaleo Largusa, whose given name is defined as, “The Voice,” goes by his emcee moniker, Son Da One when emceeing on stage and is releasing “Misinterpreted Logic E.P” online spring ’16, promising profound and witty, out-of-the-box HipHop. Son Da One will be hosting more than one release party for this E.P. hoping to boost awareness, “Misinterpreted Logic” will be available for purchase online and at each release. Born in Lihue, Kauai, Son Da One’s family moved to The Bay Area; more explicitly, the East Bay in Union City close to where his relatives lived when he was just three months old. Son Da One did not have the best childhood. He was bullied by much older adolescents when he was in primary school, mainly sparked by his ethnicity and size. Son Da One would get jumped on his walk home from elementary school to the Green Haven Apartments when he lived in Union City. If he came home and lost a fight, there was an automatic beating from his mother. Then young Son Da One was sent out the next day to fight back against his perpetrators. His mother then moved his family to Castro Valley, hoping for better opportunities for her kids. Things were not much different. Predominately Caucasian at the time, Castro Valley handed Son Da One even more problems with racial harassment from white students. Son Da One’s mother was strict and didn’t allow them on the streets due to gang activity in The Bay Area through the ’80s. When Son Da One was 11-years-old, his mother had enough of city life influences and moved the family back to Kauai. Son Da One was reintroduced to the island life coming from The Bay Area where the culture was completely different. He dressed different and didn’t speak pigeon; a creole language based in part on English spoken by many Hawaiian natives. While attending high school, there were lots of families suffering from drug abuse, especially methamphetamine and violence. Young peoples’ personal identity was being taken over by the westernized culture. Kapaa High School was filled with students who were either well off or living in poverty. Kapaa boasted the lowest S.A.T. scores in the nation at one point and kids were getting into fights every day. Son Da One says that the history of Hawaii was not being taught to students. There was a lot of anger about what was being taken away from these young people’s heritage on the islands. The lessons, traditions and history of the families were not being passed on through the educational system. Their history includes the United States overthrowing the Queen and putting her in jail (against her and the peoples will) to take over Hawaii so that the U.S. could grow sugar cane. “Whether you are Japanese, Chinese, Filipino, Portuguese, Pacific Islander, Samoan, Tongan, we are all a part of the same land; a part of the Hawaiian culture.” says Son Da One, whose passion towards Hawaii is heard loud and clear in the lyrics of his music. Son Da One grew up in a creative family. His grandfather was the Grandmaster Ben T. Largusa who studied and taught students Kali under the association of The Largusa-Villa Braille system. His grandfather and Bruce Lee were offered the role of Green Hornet by Ed Parker (who taught martial arts and had connections in Hollywood). Largusa turned it down, referring the role to Bruce Lee who eventually picked it up. “My family that lived [in Hawaii] really helped to bring me back to the essence of living. They helped me understand and appreciate the ‘ania;’ meaning, ‘the land,’ teaching the true ethics of Hawaiian culture through food, fishing, surfing and unconditional and sincere hospitality that only Hawaii knows.” says Son Da One who shares that this type of hospitality is lost within western culture. Son Da One’s father, Steven Saflor was one of the most highly sought after funk drummers in Hawaii, he was in a group called, “Fantasy.” Son Da One has lost contact with his father over the years due to his father’s constant battle with drug addiction. Saflor has recognized that drugs has ruined his music career and caused him to loose his home and become estranged to his family. Even though his father has not been around much of his life, his musical influence has impacted Son Da One deeply. Son Da One began copying down lyrics for ballads on the radio for his Auntie Stacie Johnson (previously signed to Motown as a young vocalist) who was performing cover songs with her band in Hawaii. Heavily influenced by his Auntie (who also lived with them) and her professional musical experience, Son Da One to begin writing songs himself. Son Da One saved up money for an entire summer and bought turntables. This helped him get his start in the local music scene while living in Kauai. Son Da One’s home growing up filled with music, thanks to his mom, Lois Largusa. Funky vinyl records, jazz and soul; all things Mo-Town. Artists like Miles Davis, Johnny Guitar Watson, Zapp and Roger, Earth, Wind and Fire and Serra Von filled their home with love and light. All of this helped Son Da One to eventually get into Hip Hop. “Planet Rock,” by Afrika Bambaataa, Rob Base, Too Short, Pharcyde, Saafir, Ras Kas, Common Sense were some of the first HipHop artists that Son Da One got into around ’92. “I was really drawn to lyrical [artists]” says Son Da One whose taste evolved eventually to East Coast Hip Hop such as Wu-Tang Clan, Nas and Rakim. The Break Dance culture was very influential in Son Da One’s growth in HipHop, films such “Breakin’ 2: Electric Boogaloo,” and “Beat Street” inspired young Son Da One. He is also intrigued by sports. While in high school, he played soccer, track and his all-time favorite, basketball. Son Da One received State All-Star for Vulcan-Hawaii Basketball Camp and held high school records for “stealing the ball.” Son Da One’s life would take a turn into his love of Hip-Hop instead of a path towards a basketball scholarship. He was introduced to a producer involved with Glenn Alan Medeiros, a has-been 80s child superstar in the music industry with his hit, “Nothing’s Gonna Change My Love For You,” a recording originally by George Benson. Son Da One’s first HipHop group he was a part of was called The Highlanders, made up of a multicultural collective of emcees and musicians, (brothers) Brandon “Big Buddy Blaxx” McClintic (emcees), Chad “Bear” McClintic (emcee) and Chase “Buggie” McClintic (emcee), Kaleo “Son Da One” Largusa (emcee), Paul B. Allen… (Composer, Producer, Drummer), Angus Robert Killick (guitarist) Rick Avalon (keyboardist), Peter Manos (bassist). The Highlander’s musical influences included Black Eyed Peas with their funky dance beats, the street-wise sense of The Roots and rough-around-the-edge sounds of Rage Against The Machine. The group proved successful during a four-year span touring the Hawaiian island chain and was even offered contracts with Interscope and Sony. The Highlanders turned these opportunities down for lack of creative control (true indie artists). 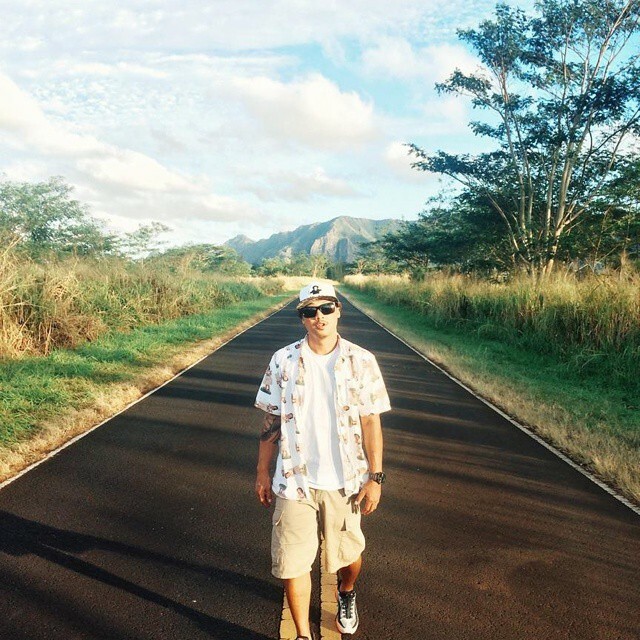 “Coming from a multi-cultural scene in Kauai, I was able to see so many different perspectives of life,”says Son Da One, who was born into a land where people worked hard to get what they needed, “[The Highlanders] is what made me who I am as an emcee even before dropping [‘Misinterpreted Logic’].” says Son Da One. The Highlanders performed with Myka 9 (Freestyle Fellowship-Haiku-Ata) who called Son Da One, “The Business!” They also performed with Atmosphere, Fatlip (Pharcyde), Pepper and L.A. Symphony. After The Highlander’s dissipated; because of egos and partying, Son Da One went his own way as a solo emcee throwing “Son Da One Presents,” variety shows. A lot of the knowledge he learned from being in a band, he applied directly to his solo career. Then Son Da One met Rod Green A.K.A. Crash a native Chicagoan emcee/producer signed to KRS-One’s label B-Boy Records that eventually went bankrupt (Crash was released from the label due to bankruptcy). Crash became Son Da One’s mentor in his career as an emcee. The economy was hitting hard, around ’07 and Crash helped to mentor Son Da One as professional artist. Son Da One was able to mold the sound he has today with the help of Crash. Gaining confidence, Son Da One then had the chance to perform with Grammy-award winning artist Coolio and on a different occasion, Medusa, Fatlip (Pharcyde) and Aplus (Hieroglyphics). “It was a blessing to meet Crash because I was in a dark place in my head. He helped me to get seasoned. He recorded a lot of music with me. He would pick me up to go to the studio.” remembers Son Da One. “The Problem Is All Inside Your Head” a music video co-wrote by Son Da One and Crash is about social issues, fighting addiction and materialism. Eli, Kauai-Native who currently lives in the Bay Area is featured as the vocalist on this track. “I’m kinda a hippie. The power of thought, that is how it was spawned.” says Son Da One. In ’07, Crash and Son Da One created Basement Fundamentalists, a complex lyrical HipHop group with Tommy Patch, a native to Kauai who possesses great emcee skills. Patch had been featured on “Coast to Coast” mix tapes. Basement Fundamentalists performed with The Alkaholiks, Parrish (EPMD), DJ Honda, Ladybug Mecca (Digable Planets), Chino XL and Zion I. The crew was getting their music out to larger HipHop crowds. Basement Fundamentalists produced an album entitled, “Lemuria Soldiers” that is unreleased at this moment. The Lost Lemuria a folklore story that olde-time Hawaiians use to explain the beauty of their islands compared to other islands and continents. The lost Lemuria is defined as a “utopia” of sorts, a lost land. Hence the title of the album. The guys have talked about releasing album online soon and donating proceeds to Kauai youth. Fast forward to ’11, Son Da One made the move to South Humboldt where he became involved with SHC (Southern Humboldt Community) Studios the following year. SHC Studio Co-Owners, Justin Miller also known as Just One (NY Hip-Hop/Reggae DJ and producer who moved to Cali in 2000) and Galen Davis (DJ, producer and drummer) met Son Da One through mutual friends. These guys currently run an in-town studio, organize and produce events and help sponsor and support the local music and arts community. Once Son Da One was invited in the studio, they immediately recorded the remix to “Garden Island Riders” which will be featured on, “Misinterpreted Logic.” The rest is history. Son Da One has become a part of the musical collective in South Humboldt and has performed with local acts such as Little Kidd Lost (HipHop Emcee), Berel Alexander (HipHop, Roots and Soul) and Lacy Redhead (R&B, HipHop and Reggae). While living in Humboldt, Son Da One has performed at The Golden Tarp Awards, Harvest Party, SHC Block Party and events at The Mateel Community Center. One such event at The Mateel was an after-party for DJ Babu (Dilated Peoples). In ’14, Son Da One received an opportunity to battle rap at “The Iron Mic Emcee” Battle in Honolulu at The Republic, a local venue in January. His battle went pretty well but Son Da One did not win against his opponent , OSNA (Hawaiian Emcee/DJ) due to a “bias crowd” applause, Son Da One reasons. “It is still debatable. I felt like I won.” Son Da One reacts. He has been battling as long as he has been involved with HipHop. His next battle, located in Corona, CA was against Ron Compton, a Compton local emcee who also runs battles in L.A. This marked the second loss for Son Da One, clearly because of forgetting his lines. “No excuses for the second battle. I drove out there that day and was stuck in traffic. I didn’t prepare correctly,” Son Da One states. He was, however prepared for his most recent battle, “L.A. Riots” against, Crown Vic of Compton in LA, February ’16. The crowd applauded and Son Da One really feels that he took the battle. “The reason why I got involved in battle rap is due to the lack of content and substance in mainstream music today. It keeps me creatively sharp. Battle rapping is one of the most purest forms of HipHop in this day in age. I use it as a platform for my music.” he says. Son Da One is awaiting the results of “L.A. Riots” but feels he he has nothing to fear in the results. He plans to continue battle rapping as a part of his career as an emcee and a tool to push his music. “Misinterpreted Logic” is set to be released spring ’16 with a release party in South Humboldt and one in the East Bay in June or July.